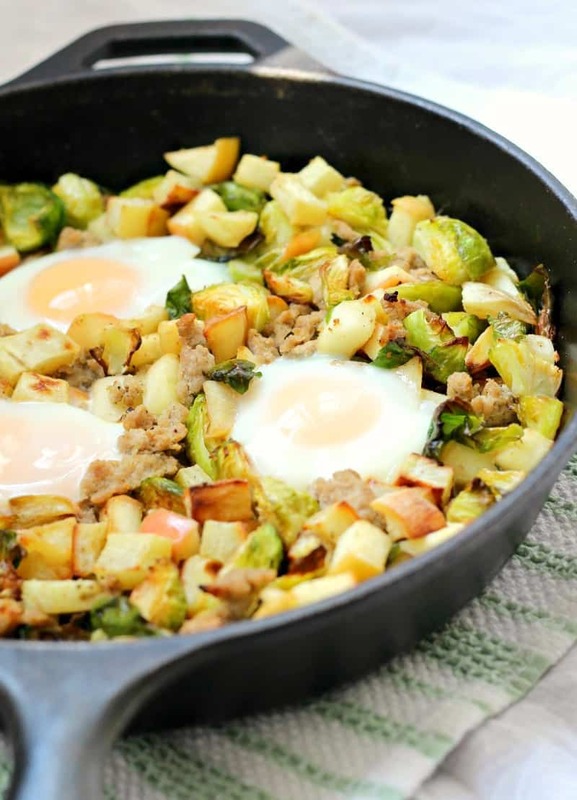 An easy, healthy, and satisfying Sweet Potato Hash made with perfectly roasted sweet potatoes and brussels sprouts, apples, ground turkey, and eggs baked right in. Serve for a weekend brunch or make ahead to have breakfast ready to go for busy weekdays. 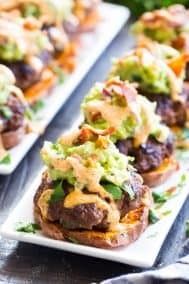 Grain free, dairy free, Paleo & Whole30 friendly! Tuesdays feel like a day for veggies, at least recipe wise, more so than other days. Isn’t Tuesday traditionally the most “productive” day of the week? You’ve gotten over the shock of Monday (yes, it’s a shock even after being alive for 10 million of them) and it’s not hump day yet. That means you do your work and eat-yo-dang-veggies. Right? And save the donuts for Friday. Hint hint – I am saving donuts for Friday. Anyway, I do tend to put a lot on my plate for Tuesdays, both veggie wise and work wise. I would probably feel all kinds of wrong doing anything “fun” on a Tuesday, unless it’s summer. Then fun is allowed any day of the week, mainly because I’ve never been great at making my own rules and look around me to see what’s allowed and what’s not. Summer = go on vacation and have fun. It’s actually a lot to live up to, really. I sometimes prefer Tuesday winters – much less pressure to make memories. But enough of my mental health woes for now and more about this breakfast hash. Some people might look at the title and/or ingredients and think I’ve totally lost touch with the reality that spring is coming, because these are “fall foods” or “holiday foods” or whatever. But, in my world, these are year round foods that are eaten on the daily. 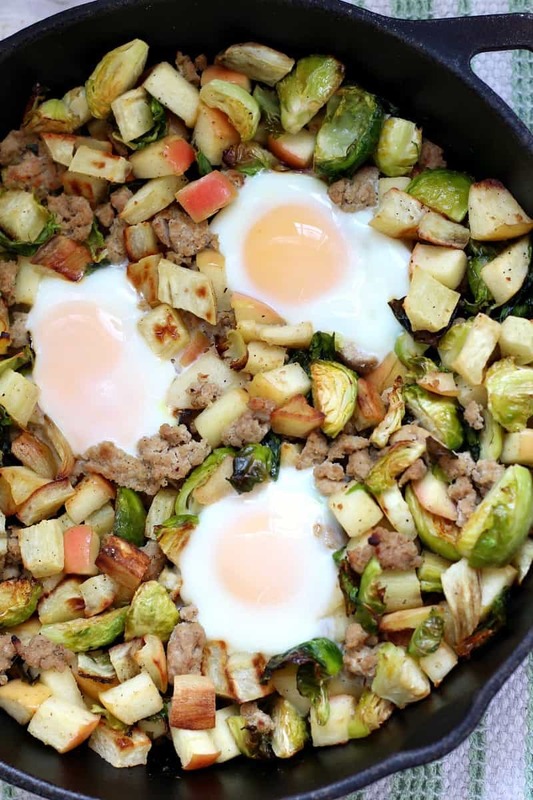 Think about it – ground turkey, apples, brussels sprouts, sweet potatoes. These are healthy staples of daily life regardless of season, thanks to well supplied grocery stores. Spring-themed foods (and donuts – hint) have their place, but we (or I) cannot solely live off of citrus and salad. I need my roasted veggies and egg bakes or I will not feel complete. 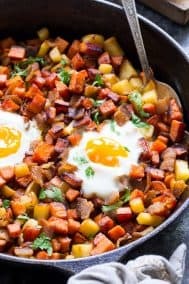 Sweet Potato breakfast hash, you complete me. You had me at…hello. Show me the money? Now that might be asking a lot. 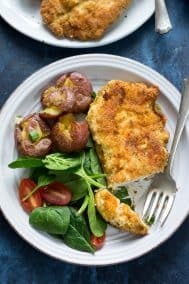 Money or no money, I have much love and respect for easy and healthy go-to recipes like this one. Nothing fancy (although you can present it looking that way) and nothing unusual – just delicious real food! Without the eggs, this is also a perfect make-ahead meal that you can throw eggs on whenever you decide to re-heat. Whether or not you’re into Paleo food, this is a good recipe to have on hand. In truth, even if you don’t eat meat, you can simply omit the ground turkey and still have an awesome meal. 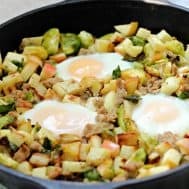 Easy and healthy Sweet potato hash with brussels sprouts, apples, and ground turkey for a healthy and satisfying breakfast, brunch, lunch or dinner! 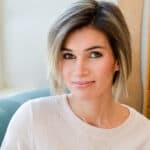 Gluten free, grain free, dairy and soy free, Paleo and Whole30 friendly. 1 and 1/2 cups sweet potatoes peeled and chopped I used white but any variety is good! In one bowl, toss the chopped sweet potatoes with 1 tbsp coconut oil to coat completely, then sprinkle with sea salt and toss to coat. 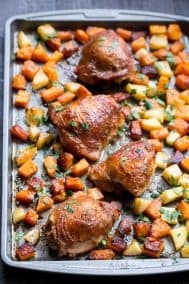 Spread potatoes out in a single layer on the parchment lined baking sheet, and roast for 20 minutes, turn/shake for even roasting, and continue to roast another 10 minutes or until soft and golden. In another bowl, toss the brussels sprouts in 1 tbsp coconut oil to coat, sprinkle with salt and spread out on the second baking sheet. Roast for about 15 minutes until soft and lightly browned. When veggies are soon to be done roasting, heat a large heavy skillet over med heat and add ghee or butter. 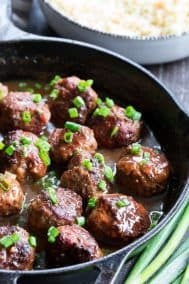 If using the minced onions, add these to the pan prior to the turkey to soften, Then, add the turkey and sprinkle with sea salt, onion powder if using, and a dash of poultry seasoning if desired. As soon as the turkey is no longer pink, stir in the chopped apples and cook together, stirring occasionally, until the apples soften and the mixture is lightly browned. 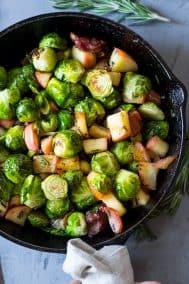 Once the sweet potatoes and brussels sprouts are done roasting, remove from oven and add everything to the large skillet, stirring to combine. 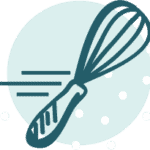 Create 3 or 4 spaces in the hash for where you want to bake in the eggs. Crack each egg into these spaces and sprinkle with a bit more salt and pepper if desired. Bake in the preheated oven (still 400) until eggs are cooked to preference - for me this was about 12 minutes. Serve for any meal! Enjoy! What do you think of when you think “Tuesday”? What supposedly seasonal foods do you eat year round? Yay or nay to brussels sprouts? i always wake up tuesday thinking it’s wednesday and then get sad. LOL! but if i had this, i would be happy. seasonal produce? yes, brussels! always. summer too! Spring is coming! At least it’s light out later even if it’s still chilly! This looks very yummy! 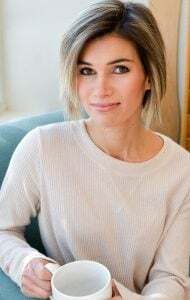 I usually go with what I am feeling like for breakfast – sometimes it aligns with seasonal flavors but I am an independent breakfast eater so I’ll do what I want haha! 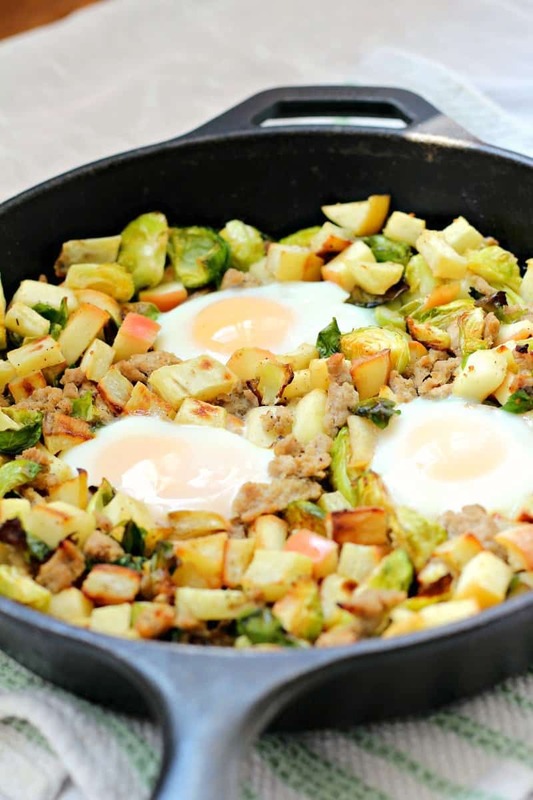 I might try this with some turkey sausage because turkey sausage + apples is one of my favorite flavor combos EVER! That would work really well, and make this even better! Tuesdays are great days for vegetables! I grocery shop on Monday and Friday so Tuesdays are when there’s lots of fresh produce in the house. 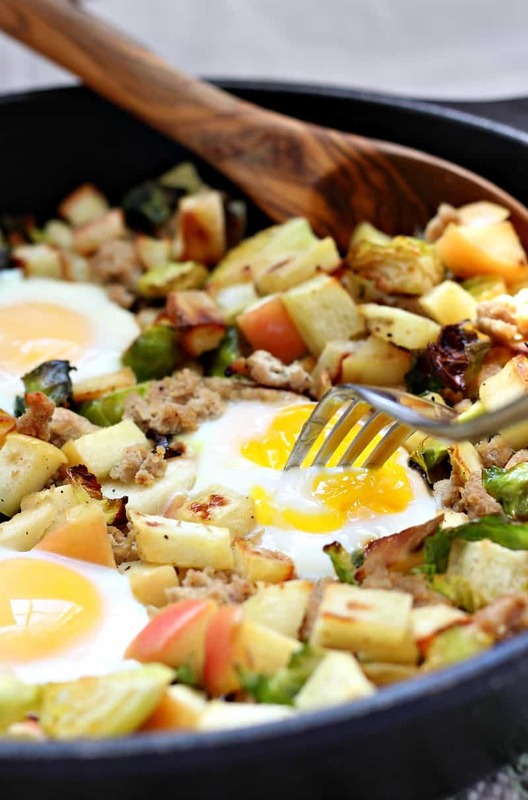 This hash makes me think of Thanksgiving—yum! Good to see you back up and running! I am definitely the most productive on Tuesdays and I’m all about the hash too year round. I know it goes against the law of nature somewhat, but still it’s too good not to have. Thanks! I’m hoping that’s the end of the problems, but, what do I know? Agree about those sweet potatoes and brussels! I would have never thought to put Brussel sprouts and apples together but that sounds good, thanks for sharing. Glad to see you are back and able to run again. I don’t blame you, they’re amazing! I posted a hash sort of like this a couple of weeks ago. I love the savory some days. Mine had bacon… need to try it with turkey too! I love crisp apples in savory things! So good!…especially with chicken haha! I’ve got some Brussels sprouts in the fridge, they may have found a new purpose! I might use more turkey since my daughter and I share breakfasts and she doesn’t do eggs. Thanks for so many super recipes! I hope you try this! I love the sweet savory combo. 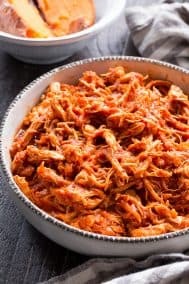 You could totally use more turkey and skip the eggs entirely, still a great combo and glad to hear you like my recipes! 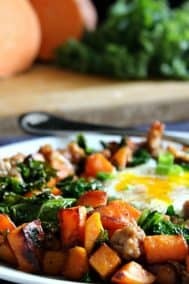 I love a good mix of veggies with an egg thrown on top for protein. I bet the apple adds just the right touch of sweetness. Monday’s are always my rough day: one because the WIR linkup so I have more work (which I wouldn’t change for anything) and two because back to reality. Do the brussell sprouts bother your IBS? Sometimes they definitely do! I try to limit those and broccoli and when I do eat them, I cook them really well so they’re pretty soft.